State Bank of India chairman Pratip Chaudhuri came down heavily on the Reserve Bank of India stating that an interest rate hike would have been less damaging that the central bank’s measures to choke liquidity. The statement comes on a day when bond yields shot up and bank stocks were plunged following RBI’s second round of measures to drain liquidity to support the rupee. “The RBI has to check liquidity and we hope it is a shortterm measure. It is always better to hike interest rate than choke liquidity,” he said. Speaking to newspersons on the sidelines of the Ficci banking conclave on Wednesday. the SBI chairman pointed out that stability of rupee is the priority of RBI. However, he felt that the objective could be achieved by raising policy rates. “Interest rate is the proper lever for managing the money market, bond market and Gsec market. Therefore, in order to rein in the prices in the bond market, interest rate which is a much better instrument should have been applied to curb liquidity,” he added. On Wednesday, the rupee gained 64 paise closing at 59.13 against the US dollar. But the bond markets took the brunt of RBI’s measures. Prices of the benchmark 10-year bond crashed as yields rose intraday to 8.5% which is a rise of 95 basis points since RBI announced its first round of liquidity tightening measures. To underline its seriousness, the central bank accepted a high cut-off yield of 11% at an auction of 91-day treasury bills—the highest in six years. According to Chaudhuri, the RBI action has severely affected the bond market instantly and the yields shot up creating panic in the market and saw interest rates hardening in the short term. “Even till today, the G-sec market is languishing with the RBI and government auction almost failing. For all practical purposes, money market instruments are either not readily available or come at a high cost,” he added. Bankers are now waiting to see if RBI measures last beyond August. If the present tight money policy continues until the end of the second quarter, banks will take a big hit in their second quarter results. “We expect these measures to last for not more than amonth. However, if the measures were to persist, the higher funding cost of banks may translate into higher lending rates thereby endangering the already weak investment cycle. We expect downside risks to our GDP growth forecast of 5.5% in FY14, if these measures were to last over a month,” said Upasna Bhardwaj, economist, ING Vysya Bank. 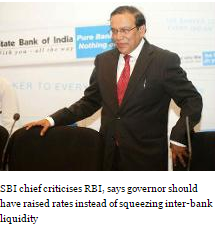 The SBI chairman said, “Any change which seriously impacts the market should be implemented in a calibrated manner. It is my view that RBI should provide at least 10-15 days to allow the market to adjust to the new liquidity measures. The repo rate is now 7.25% but the real repo is 10.25%.” Chaudhuri reiterated that he is in favour of abolition of CRR to infuse liquidity into the system which he has been preaching for a year. “CRR abolition could inject Rs 3 lakh crore in the capital starved economy. In fact, in last one year, CRR has been cut down to 4% from 6%, which vindicates my stand,” he added. MUMBAI: Government owned Bank of India took a lead in lowering its lending rate after the finance ministry nudged bank chiefs on Wednesday to reduce rates to kickstart the economy. Bank of India informed the stock exchange that’s its base rate would be lowered from 10.25% to 10% with effect from July 8. Most other PSU banks have pegged their base rate at 10.25% while State Bank of India’s is lowest at 9.70%. Banks had last reduced rates in January by by around 25 basis points after RBI cut repo rate and cash reserve ratio by 25 bps each. However, there after RBI lowered repo rate by 50 bps but banks have refrained from lowering rates on grounds that a cut in repo rate does not reduce their cost of funds. During the meeting, FM asked each bank about measures that can be taken to drive growth and improving demand for loan from the manufacturing sector. FM also expressed his concern about poor deposit growth, “If interest rates are an hindrance for deposit growth, it has to be addressed.” he said, according to bank chiefs who were present in the meeting. PSU bank’s credit rose 15.6% while deposits rose 14.9% in fiscal year 2012-13. He was very critical about RBI contribution towards growth. The RBI’s role is not just to control inflation but also to support growth and job creation.